This soft pink spray with its carnations, gladioli and larkspur holds the promise of a brighter tomorrow. 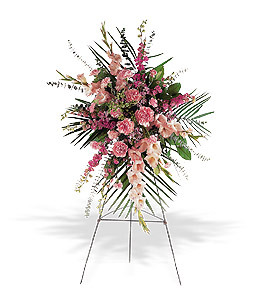 One spray of pink carnations, gladioli, larkspur and waxflower is delivered on an easel. Page loaded in 0.5137 seconds.